Eleven people died. Anywhere from 3 million to 5 million barrels of oil gushed into the Gulf of Mexico over 87 days, covering 68,000 square miles. Eight billion oysters were lost. Tens of thousands of water birds perished. 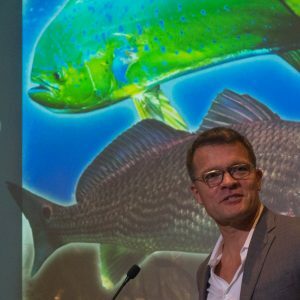 It’s estimated 2 trillion to 5 trillion fish died from the oil – some immediately, some later on, and some still struggling from the lingering impacts. 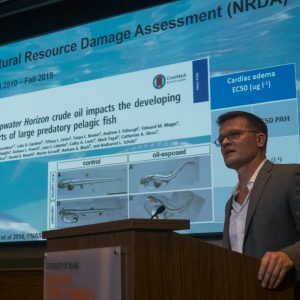 “It was an epic environmental disaster, no joke,” Martin Grosell, professor in the Department of Marine Biology and Ecology at the University of Miami’s Rosenstiel School of Marine and Atmospheric Science, said of the Deepwater Horizon oil spill in April 2010. 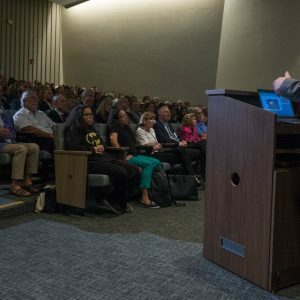 Grosell kicked off the 2018 Sea Secrets lecture series Tuesday evening at the Rosenstiel School before an overflow audience of more than 300 people. 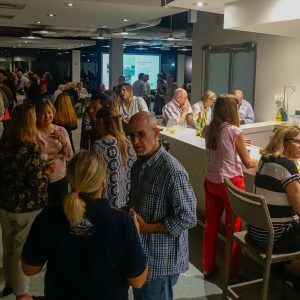 The popular lecture series features engaging talks by scholars, journalists, photographers and others passionate about issues related to the environment, sustainability and the world’s oceans and those that rely on its survival. 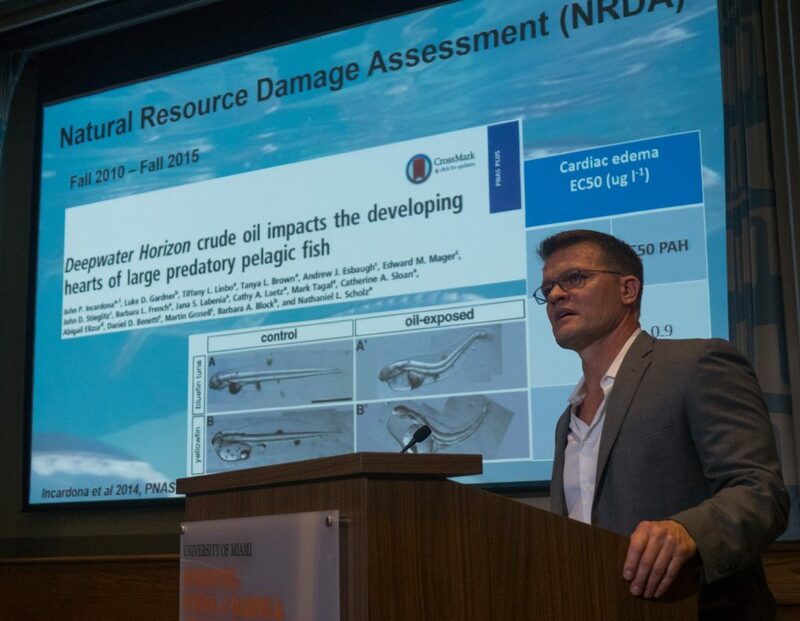 Following the spill, BP, the multinational oil and gas company, put up $500 million in 2010 to fund research on the spill’s impact under the Gulf of Mexico Research Initiative (GoMRI). 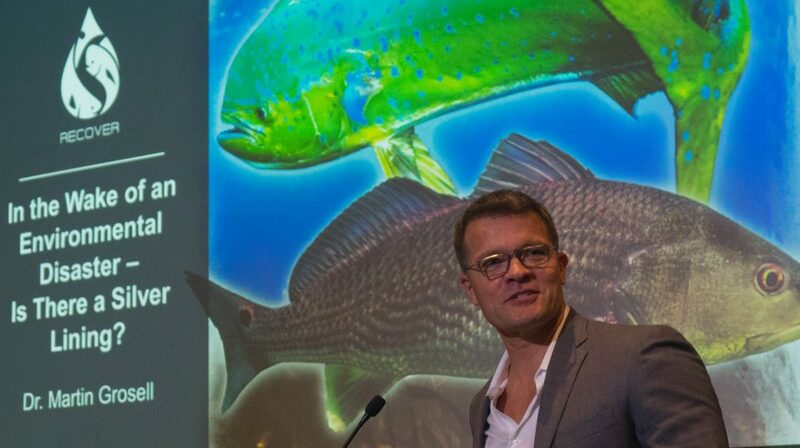 Grosell’s research consortium RECOVER (http://recoverconsortium.org), which received some of the funding, involves dozens of scientists from several institutions.In his talk, “In the Wake of an Environmental Disaster – Is There a Silver Lining?,” Grosell methodically shared his research on the oil’s impact on open ocean fish, most notably mahi-mahi embryos, larvae and juveniles. While it’s commonly thought oil and water don’t mix, Grosell pointed out that as the oil breaks down, toxic hydrocarbon compounds disperse through the water and interact with life forms. 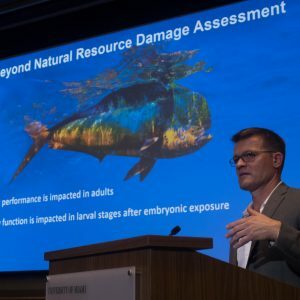 The research, conducted at the Rosenstiel School’s experimental fish hatchery, determined the oil resulted in reduced cardiac performance in mahi-mahi, along with poor vision and undeveloped eyes. These abnormalities also disrupted their migration, impacted spawning, and since they couldn’t swim as fast or as long as normal, increased their susceptibility to predators. 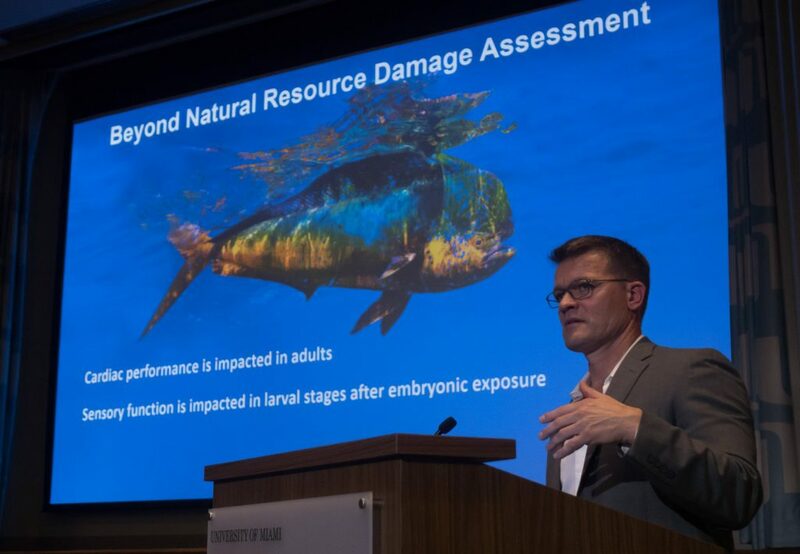 There is also evidence in tests of other fish that the oil resulted in negative impacts to brain function that made the fish easy targets for predators. 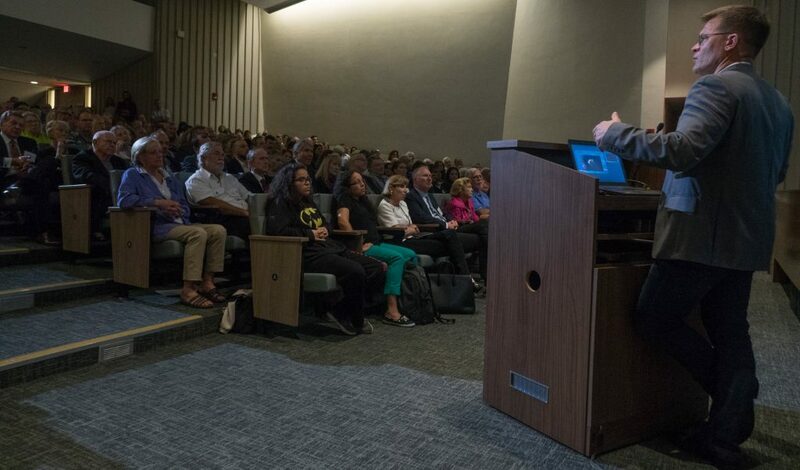 Grosell said research since Deepwater Horizon has given the scientific community better strategies for responding to the next inevitable oil spill, such as clearer predictions on oil flow and damage. 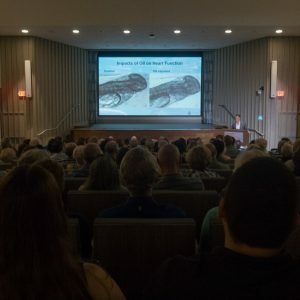 The research has also provided an enormous amount of new information about the Gulf of Mexico ecosystem, including the spawning grounds of open ocean fish species, and about the species themselves. They tagged adult mahi-mahi, and tracked them for more than 90 days, learning where they traveled, how deep they dove, and that they swam 100 kilometers a day – operating at 80 percent capacity at all times. “This is living life in the fast lane,” Grosell remarked. The scientists also learned that mahi-mahi embryos sense damaging UV light, which they avoid by sinking deeper in water. “We don’t know how they do this,” he said. 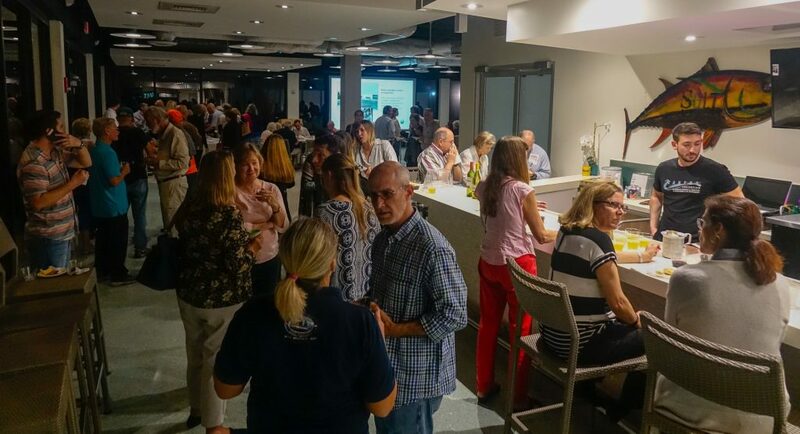 Tuesday’s event was opened by Rosenstiel School Dean Roni Avissar, who welcomed the guests and noted that the Rosenstiel School will be celebrating its 75th anniversary this year with a series of events and lectures throughout the year.